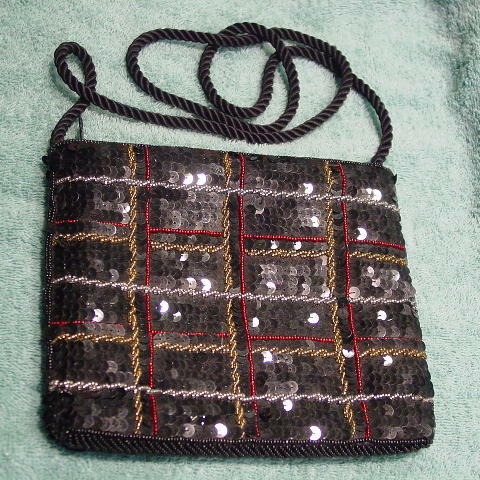 This shiny black sequined evening purse is in a black somewhat padded fabric. Because the sequins overlap, you can't see the fabric. There are tiny black beads along the edges, 4 rows at the top (2 rows on each side of the zipper), 2 rows down the sides, and multiple rows in a chevron pattern at the bottom. There are a couple of black beads missing at the very bottom. It has 2 horizontal and 3 vertical rows of tiny red beads and 3 vertical and 2 horizontal twine pattern gold-tone tiny beads. It also has 2 horizontal rows of silver-tone tiny beads in the twine pattern. There is a very nice satiny black lining with an interior open pocket. It has a 40" long black cord shoulder strap. It's from a Belgian model. It was her evening purse while modeling in Paris.